My friend Isadore’s voice was strained with frustration. After phone calls to the dealership, and various failed attempts to dislodge the seized ignition tumbler, he was giving up. The fact that he had also just lost his full-time job days earlier did not help his mood. “I can’t afford to fix it. I might as well just give it back”, he moaned. We agreed that it was worth one more trip to the dealership. Driving from the pot-holed gravel road of the First Nations reserve to the fresh blacktop by the gleaming new powder-coated aluminum and glass auto dealership was like passing from one world to another. “It is the big building,” he said quietly. We parked in a customer service slot, and he mustered up enough courage to enter through the full-length glass door directly ahead of us. He seemed even shorter in the high-ceilinged reception area adjacent to the vast, spotless service centre. Did he realize he was now in a temple of auto technology and he would need just the right approach? It took conscious effort for me to be quiet and let him start. The young attendant said, “How can I help you, sir?” and then quickly pecked at his keyboard behind the high counter, entering all the pertinent information while squinting into the hidden computer screen. I could hardly contain my composure. Relationship? What was he thinking? That approach would not get him anywhere in this place! The manager of the department arrived. She started pecking at her keyboard. She did not sound promising. The car would have to be towed at the hapless customer’s expense, and warranty coverage was not assured. He was given an 800 number to call and register his complaint. Isadore started to head for the door, conceding defeat. “Yes, it looks that way,” came the meek response from the service manager. “Well, I think we will,” came the equally meek response. We burst out through the glass door and breathed in the fresh air. “Wow, this is a really good day!” Isadore said, his face gleaming with optimism and renewed confidence. He called the tow truck driver and insisted that his car be towed to the dealership that day. “Just follow me,” Isadore said. I drove behind him as he guided his newly repaired, warranty-covered import to the longhouse on the reserve. He entered the longhouse with sure steps, leading me through the cluttered kitchen, along a long hall and down a ramp onto a dirt floor. The chill and dampness of a B.C. winter day were held in check by two huge iron barrel stoves at either end of the low, open-raftered structure. At a rectangular table in the middle of the room sat 15 or so individuals of all ages, reporting on the activities of the previous month. I was offered a seat at the table, and I awkwardly sat down. After more reports, a simple meal was served. I hung back and waited till the end of the line before serving myself, not wanting to break some protocol that might be lurking in the shadows. After eating, the elders, including Isadore, were seated at the table, and the real meeting began. He was recognized by name and looked so at home. I sat on the outskirts on the lowest level of the rough plank bleachers that surrounded the building and stared at the black, earthen floor. That earth must have witnessed many ceremonies that would seem very strange to me. Being in this centre of Indigenous culture, tradition and religion made me uneasy. As the meeting progressed, I was amazed. Age was respected, first names were used, participants deferred to one another, and decisions were made based on consensus. Congregational churches could learn a thing or two from this! During one of the intermissions, when participants were serenaded by drums and chanting, I ducked out into the cold drizzle outside. I slid past a group of grinning youth in the parking lot and climbed into my familiar minivan, resisting the temptation to lock the doors. 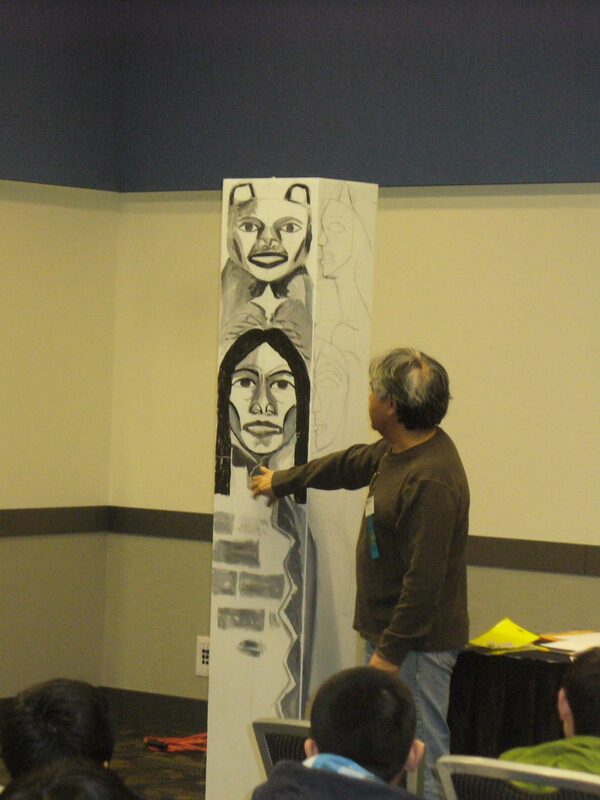 Isadore stayed behind to present his idea of carving a residential school healing pole, with indigenous and non-indigenous people working together. The concept now seemed more relevant than ever. How can my world and Isadore’s world ever intersect in such a way that meaningful trust and relationship can be built? We had seen it start to happen at Missions Fest Vancouver the previous month, where the pole carving was featured in the main exhibition hall. Hundreds of people saw indigenous and non-indigenous carvers working together on a yellow cedar pole that will tell the story of how pain and separation are giving way to truth, healing and trust. Just the process of shaping this tree that grew strong during the residential school era is powerful. Many stopped to help and to listen to stories of redemption. The pole will now travel to churches and communities in British Columbia and perhaps beyond. Isadore and I will tell our stories of our journey and our faith in Christ and how our lives are being enriched by one another. We hope many more will join us on this path of reconciliation. The pole is only a small token, but it can become a rallying point and a beacon of hope. That is our prayer. Don Klaassen is a church mission coach with Outreach Canada (outreach.ca).